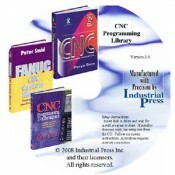 This library is a collection of three CNC Programming Handbook titles by Peter Smid, each on a separate CD. Each contains the complete text of the book in exact pagination. Supplemental CDs packaged with the books are included. The following is a brief description of each title. Each is linked to separate product pages for more information. Be sure to return here to place the full library in your shopping cart. Click here for the full description. Over its first two editions, this best-selling book has become the de facto standard for training and reference material at all levels of CNC programming. Used in hundreds of educational institutions around the world as the primary text for CNC courses, and used daily by many in-field CNC programmers and machine operators, this book literally defines CNC programming. Written with careful attention to detail, there are no compromises. Many of the changes in this new 3rd Edition are the direct result of comments and suggestions received from many CNC professionals in the field. This extraordinarily comprehensive work continues to be packed with over one thousand illustrations, tables, formulas, tips, shortcuts, and practical examples. The included CD-ROM now contains a fully functional 15-day shareware version of CNC tool path editor/simulator, NCPlot™. This powerful, easy-to-learn software includes an amazing array of features, many not found in competitive products. NCPlot offers an unmatched combination of simplicity of use and richness of features. Support for many advanced control options is standard, including a macro interpreter that simulates Fanuc and similar macro programs. Click here for the full description. This practical and very useful resource covers several programming subjects, including how to program cams and tapered end mills, that are virtually impossible to find anywhere. Other, more common, subjects, such as cutter radius offset and thread milling are covered in great depth. Click here for the full description. An invaluable companion to the author’s best selling CNC Programming Handbook, this book is a general introduction to the subject of macros (known as Custom Macros or User Macros). Its purpose is to make you aware of what macros are, how to develop them, and how to use them effectively. It also explores important related subjects and identifies several other helpful topics in this increasingly important and exciting field of CNC programming.